So I have a situation. A very close friend of mine told me that I have never dealt with my anger. So I decided to research more about anger. My family was an alcoholic family. My dad was the one that drank. I remember specific events usually involving my parents arguing and I think I just learned to not argue too much. There are times I do get angry and really want to let it out but I just do not see why we need to argue. I mean what is the difference between arguing and having a lively discussion? Does being angry mean we have to scream, fight, why can it just not be normal to have a discussion about what you are feeling? Do I have to scream? I know having come from an alcoholic family that we, as the children, sometimes have anger issues where we learn to not express it. My question I guess, what is anger and what is the right way to express it? I am very confused, I know I am angry at certain things but do I have to scream it out? Please help me understand what anger is. Hello, and thanks for telling your story here. 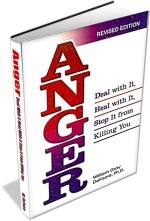 It is great that you want to understand anger, and how to express it in healthy ways. I will try to help. It will also help you to do the exercises described on this FAQ page. These are powerful tools, and the more you use them, the more they will help you. The bottom line here is that anger is a natural, healthy emotion, but most of us never learned to express it in healthy ways. You can be the exception to that rule. You can be an emotionally healthy person, if you set your mind and heart to it. If you haven't already read it, I suggest that you read the book Adult Children of Alcoholics, by Janet G. Woititz. Above all, believe in yourself and the goodness that is who you are. You can do this.